The capital of Nevis is, even among the modest, charming cities of the Caribbean islands, a particularly modest and charming town. With a population of only 1,500, Charlestown is the sort of place in which you can still feel the tranquility and the quiet sense of remove that characterized the traditional Caribbean. 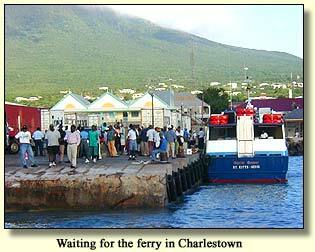 Life on Nevis is in general quite calm; in Charlestown, it seems to be punctuated by only two events each day--the arrivals of the morning and the afternoon ferry from St. Kitts. Whenever a ferry comes in, a small crowd gathers to watch the wares being unloaded and brought to the nearby open market on the waterfront. Birthplace of the great American statesman Alexander Hamilton. The original house, built in 1680, was destroyed by an earthquake in 1840. There now stands on the site a carefully constructed replica. Inside is a fine museum, dedicated not only to Hamiltonian memorabilia but also to Nevisian history. Hamilton, born on January 11, 1757, was the illegitimate son of Scotsman James Hamilton and Nevisian Rachael Fawcett Levine. Bright and enterprising, he was at seventeen sent to the North American colonies for education at King's College (now Columbia University) in New York. The young man soon became involved in politics, and with the outbreak of the Revolution he became a captain of artillery. In that capacity he attracted the attention of George Washington, whom he served as secretary and aide-de-camp. Hamilton was one of the original members of the continental congress in Philadelphia, and he was chosen as the first Secretary of the United States Treasury. A brilliant economist, Hamilton was largely responsible for the federalist financial policies of the new nation. His opposition to Aaron Burr during the Presidential contest of 1800 undoubtedly contributed to the election of Burr's rival, Thomas Jefferson; his renewed opposition to Burr in the 1804 campaign for the governorship of New York undoubtedly contributed to Burr's issuance of a challenge to duel. Hamilton accepted: the two met at Weehawken Heights, NJ, on a bluff overlooking the Hudson River, and Hamilton was fatally wounded. 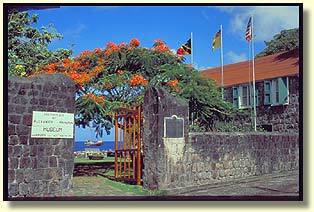 This central civic space honors those Nevisians who served in World Wars I & II. The Jewish Cemetery in Charlestown is a tangible reminder of a once vibrant community that existed on the island of Nevis. The cemetery contains gravestones that are engraved in English, Hebrew and Portuguese, dating from 1679 to 1768. Once constituting 25% of the island's population, the Sephardic Jews of Nevis brought to the island the secret of how to crystallize sugar, a technique that had been discovered and protected by the Portuguese and the Spanish. Expelled from Brazil during the 17th century, their arrival in Nevis helped to make the island the 'Queen of the Caribbees,' a title that referred primarily to its remarkable sugar production. A stone-walled path, known as the 'Jews Walk,' leads from the cemetery to the supposed site of the community's synagogue, which is believed to have been built in 1684. This captivating museum contains the largest collection of Nelson memorabilia in the West, and it offers a fascinating introduction to the island's Nelson heritage.